11 Oct 2017 Washington, D.C. Establishment forces on both sides of the aisle in Washington have either been unwilling or unable to effectively advance President Trump’s agenda, which is totally unacceptable. The best way to advance the ‘America First’ movement is to hold elected leaders accountable – get on board and get the job done or be replaced by someone who will. Our ‘Great America’ slate, which will expand in the coming weeks, is entirely about delivering results. The group was very active in Alabama’s GOP U.S. Senate primary runoff between appointed Sen. Luther Strange and conservative challenger Judge Roy Moore. After a rally Great America Alliance bus tour rally where former Alaska Gov. Sarah Palin—the 2008 GOP vice presidential nominee—and former White House official Dr. Sebastian Gorka campaigned for Moore, the judge went on to win big on Sept. 26 election defeating Strange by more than nine points. 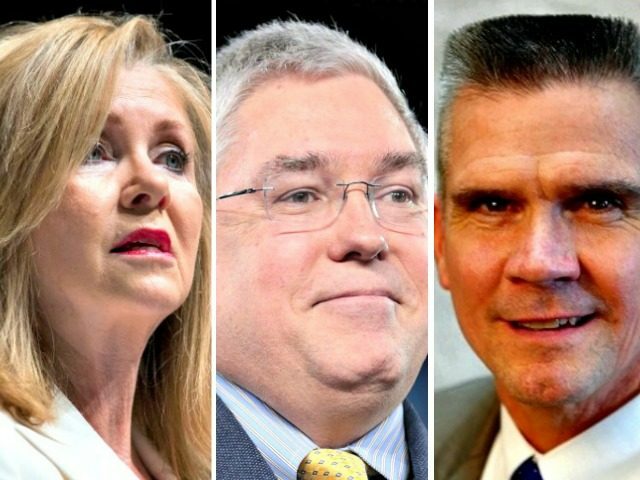 This first three endorsements is expected to grow past this as there are a number of major competitive primaries and general elections next year, and Great America Alliance is expected to—sources close to the organization tell Breitbart News—engage in many more races nationwide. The key thing about each of these first three races, however, that is interesting is that each of these three candidates are extraordinarily serious, each are likely to win their primaries especially with this extra boost, and each if and when elected would create a headache for the Washington establishment particularly Senate Majority Leader Mitch McConnell. Tennessee sources tell Breitbart News that McConnell and his allies are desperately searching for an alternative to Blackburn, who has emerged as the clear frontrunner in the wake of the announcement from Sen. Bob Corker (R-TN) that he is retiring at the end of this term. Corker announced his retirement the day after a Breitbart News investigation uncovered a suspect real estate deal he is involved in in Mobile, Alabama. That day also happened to be Sept. 26, the day of Alabama’s GOP primary runoff where Moore smoked Strange, and Corker’s announcement came just hours before the polls closed in Alabama. Then, a subsequent Breitbart News investigative report led to Tennessee Gov. Bill Haslam, a billionaire, from deciding against a run for the U.S. Senate—clearing the way for the conservative Blackburn to emerge as the frontrunner. Meanwhile, Rosendale’s fiercely independent-minded campaign—he’s been campaigning on the need to repeal Obamacare, build a border wall on the U.S. border with Mexico, and break the logjam in the U.S. Senate to open the door for President Trump’s agenda—has the establishment in Washington worried and seeking for another candidate. But, efforts so far have been unsuccessful as the wealthy Troy Downing—a Big Sky transplant from California—and judge Russell Fagg have failed to gain traction in the early going in Montana. Out in West Virginia, meanwhile, Rep. Evan Jenkins (R-WV)—McConnell’s handpicked candidate—is having serious problems getting momentum. Jenkins is a former Democrat who supported Hillary Clinton for president in 2008, and sources close to the Jenkins campaign have said he is even considering dropping out of the race since his fundraising is so lackluster. Morrisey is consolidating support, and Jenkins’ inability to step up as a serious candidate is hurting McConnell’s reputation as the Senate Majority Leader has gone all in to try to push his candidacy despite Jenkins’ failure to raise serious campaign cash. All of this of course comes as McConnell was soundly rejected in Alabama by Republican voters on Sept. 26, when Judge Moore—who campaigned on saying he believed McConnell should step down as Majority Leader—defeated McConnell’s candidate, Strange, by nine points. McConnell’s various affiliated organizations spent millions upon millions of dollars unsuccessfully in Alabama.